This Citizen's men's dress timepiece is a combination of functional simplicity with a touch of timeless elegance. This model features a stainless steel case and bracelet with blue dial. Additional features include a chronograph and water resistant to 100 metres.Featuring Citizen's award-winning Eco-Drive technology which harnesses both natural and artificial light and converts it into energy to power the watch, a watch that never needs a battery. 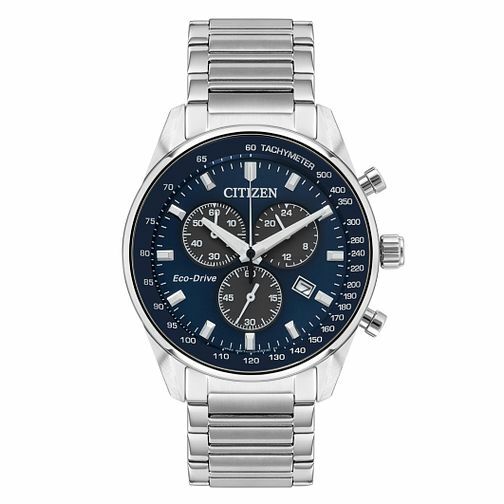 Citizen Men's Blue Dial Chronograph Bracelet Watch is rated 5.0 out of 5 by 1. Rated 5 out of 5 by Anonymous from Great Trendy and smart looking watch that fits in to all aspects of life.